THE TEN OF CUPS – This is a permanence of joy, love, friendship. The kind of family we all work to create, a family we can trust, rely on, one that’s there for us in the best and worst times. This is the family you look forward to seeing during holidays and on special occasions. The ones that come running out to greet you when you arrive at their house, smiles of joy on their faces. The Querent can be told that this family – or family of friends – can or is theirs. 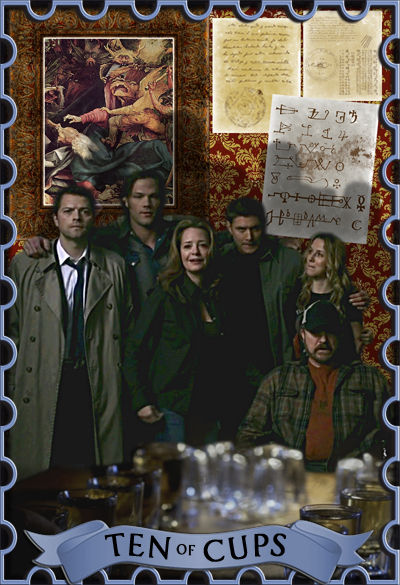 However briefly, this was the Winchester family – Team Free Will. Had a bit of fun with this one, recreating Bobby’s wallpaper and finding him a new painting for his wall!